The control panel is what receives and transmits the alarm signals to the monitoring station. It should be placed in a location that gives easy access to it, but should be hidden so as not to be readily visible. 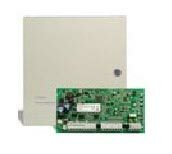 This is a 6 zone alarm panel and with modules can be expanded to 32 zones. This is a 8 zone alarm panel that is expandable to 48 zones and unlike the PC-1616 can be split into 2 independent systems, good for use in a office warehouse situation or a house and bachelor, this way you only have to pay one monitoring charge. 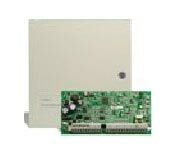 This is a 6 zone alarm panel to which you can add up to 32 wireless zones. 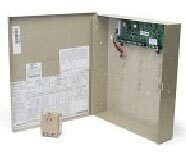 This panel is used when it is not possible to pass wires to certain detectors, and you can combine both wired and wireless detectors with this panel. This is also a LCD backlit keypad with emergency buttons. Contacts are installed on doors and windows. They are usually made of 2 parts (contact and magnet). When the door or window is opened more than ½ inch it activates the alarm. This is wireless Contact we use it when we can not run a wire . Detect the sound of breaking glass. They are used mainly when it would be too costly to add contacts on a number of windows or where a person has more than one pet. 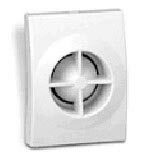 Motion detectors are used to protect a large space and are defined by the area they can protect (40ft x 40ft). They detect movement and also a change in the environment. Used where pets are present, are rated not to detect animals less than 80lb. Ce détecteur de fumée a un rayon de 380 degrés. Il se déclenche lorsqu'il y a une fumée dense. Detects a change in temperature. A necessity if you winter south, or have a cottage. Used to detect temperatures above 135 degrees Fahrenheit. Usually installed in a cooking area with risk of fire or next to electrical panel. Most commonly installed in basements or next to sump pumps to protect against water damage. Are activated when the alarm system is activated. They are available for both exterior and interior use. Are rated by decibels. Many models available. 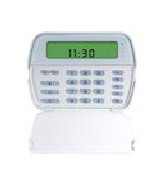 Are used to arm or disarm the alarm system from a distance. (range is approx.100 feet from the alarm panel). They also can be programmed as a panic button. Monitoring Service are provided by LANVAC, They are very professional and courteous. Your alarm system is monitored 24 hours a day, 7 days a week. Get 12 months free monitoring on all new alarm systems or 6 months on existing ones.